Friday treat! Okay, I’ll confess that I didn’t make the dough. But seeing these dough disks in the freezer section made me think that it would be fun to make empanadas today, so I guess it evens out. I decided to go the baked route, and with a diced portobello mushroom filling. I added chopped garlic, yellow onion and mushroom to olive oil and let cook for about five minutes. Meanwhile I thawed the dough discs, and rolled them out into a slightly larger, malleable platform. Next, the cheese. When the mushrooms were ready I added about two tablespoons of filling to each dough disk, folded them over into half-moons and crimped the edges with a fork. I put a few tablespoons of olive oil in the baking dish and let the empanadas cook for 4-5 minutes each side. The plantain was pretty simple as well, requiring only that I halve it and allow it to bake on high (500 degree) heat for about 5 minutes each side. This was one tasty dinner! I’m glad I went the baked option, which was more a convenience issue than anything, as the empanadas and plantains tasted just as yummy as if fried. Don’t think it’s just the public health-er in me. I speak the truth. There are forces in this world I don’t understand. Not a very profound statement, but I am confused! Am I supposed to just follow signs, “understand”, and live life for what it seemingly brings me or wants of me? Or do I react to messages that run counter to my wishes and wants? Don’t know. Can’t she just stick to the food?, you might wonder. Uh, yes. ‘Cause that I do understand. That, and lemon colored lion t-shirts (see end of post). 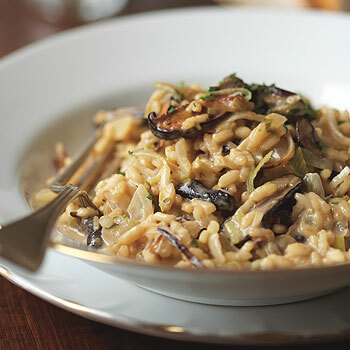 I found this recipe on epicurious.com for “Risotto with Leeks, Shitake Mushrooms and Truffles” because I wanted to approximate a dinner that I had in Atlanta while celebrating my sister’s 40th. Mine was not as good but hey, I’m a first timer!